Little Caesars® Pizza Kit Fundraising Program was founded as a result of the company's strong commitment to community and family. As a long-time sponsor of numerous youth sports teams, the founders of Little Caesars® could see the need for additional funding continue to grow year after year. In answer to that need, the company developed the Pizza Kit Fundraising Program as a new and innovative way to help those teams raise additional dollars. Since its introduction in the Detroit area in 1997, Little Caesars® Pizza Kit Fundraising Program has become the “hottest fundraiser in America” for all types of nonprofit groups/organizations. Today, Little Caesars® Pizza Kit Fundraising Program proudly helps raise millions of dollars for thousands of schools, churches, sports teams and other nonprofit organizations throughout the continental United States and in Ontario, Southeastern Alberta, Saskatchewan and Manitoba, Canada. To be the fundraising partner of choice in every community by working with our customers to achieve their goals by providing the highest quality, name brand products at an exceptional value, while delivering personalized service that exceeds expectations. Ilitch Holdings, Inc., was established in 1999 to provide the companies owned by Michael and/or Marian Ilitch with professional services. The Ilitch companies, the eleven businesses owned by Detroit entrepreneurs Michael and/or Marian Ilitch, all started with pizza, once thought of as simply a snack food. 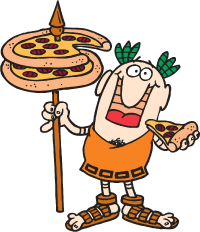 But hard work and innovation grew one Little Caesars pizza store in the Detroit area into a world-class food, sports and entertainment organization. The Ilitch companies represent leading brands including Little Caesars®, the Detroit Red Wings, the Detroit Tigers, Olympia Entertainment, Blue Line Foodservice Distribution, Champion Foods, Little Caesars Pizza Kit Fundraising Program, MotorCity Casino Hotel and Olympia Development. Click here to learn more about Ilitch Companies.